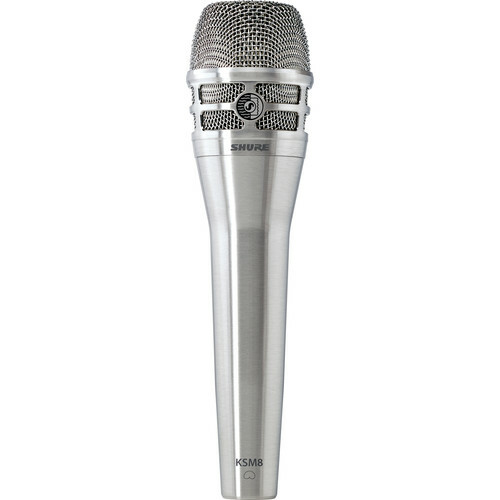 The nickel KSM8/N Dualdyne Dynamic Handheld Vocal Microphone from Shure is a dual-diaphragm dynamic microphone crafted for vocal reproduction and sound-reinforcement in live performances and top-tier professional venues. Box Dimensions (LxWxH) 10.0 x 4.8 x 3.3"
KSM8/N Dualdyne Dynamic Handheld Vocal Microphone (Nickel) is rated 4.8 out of 5 by 6. Rated 5 out of 5 by Chalupa from Lives Up to the Hype Very natural sounding and easy (and pricey!) to use vocal microphone. All the stuff about huge sweet spot, controlled proximity effect, and natural midrange is true. OTOH, if you're looking for the 8kHz zing, it's missing in action. Rated 5 out of 5 by Anonymous from KSM8 - So Far Very Impressive and Everything They Say It Is I have not had a chance to use the KSM8 extensively, but I was very impressed with the balanced tone. In the studio, I used it direct-in and almost forgot that I wasn't using EQ. When live, for my voice I needed to drop off some bass, and give the 1khz a bump up, and a smaller bump ahead of it, because I like air. But, yes, it has minimal proximity effect, but just enough to feel like you can eat the mic and get some power without spiking the bass. But be advised at first I was not sure if I would like it, because I was so used to using an SM58, that I kind of missed the proximity effect, which is a valid effect!... but this thing is a different animal, and I am getting used to it now and it makes alot of sense. With an SM58, I always felt like I had to artificially manipulate how I sing in order for the vocal to come out the way I want to hear it. When I first tried the KSM8, I was totally oversinging, and feeling slightly anxious because the mic wouldnt respond to my usual way of singing in an SM58. WIth the KSM8, I feel like I can sing more naturally (as if I were singing unplugged without any mic)... I would say it is definitely not the same as no mic, and I still have to watch my sibilance a bit, but especially plosives when close to the mic, but it's way easier to control that an SM58 which always requires a heightened state of awareness to ensure that you are aligned correctly and twisting your diction enough to come out of the PA cleanly and as desired. The plosive issue seems to disappear when I pull off the mic. When in the studio, the KSM8 reminded me of the EV635A/B which I had recently used to record poetry, as it is also a mic made for the human voice, and requires minimal EQ.... I am not a Microphone master, but to my ear, the EV635 and KSM8 had a similar flat EQ suited for voice, with a little bit of sizzle in the high end. Highly recommend this mic. Rated 5 out of 5 by Johnt from Wonderful dynamic I love this mic. Sounds really excellent in a mix, and whatever bleed from the band actually sounds good and adds something positive - like another nice room mic. Takes EQ very well. I would say it does the things a 58 does for live vocals while sounding like a supercharged SM7. It's pricey, but I'd buy again. 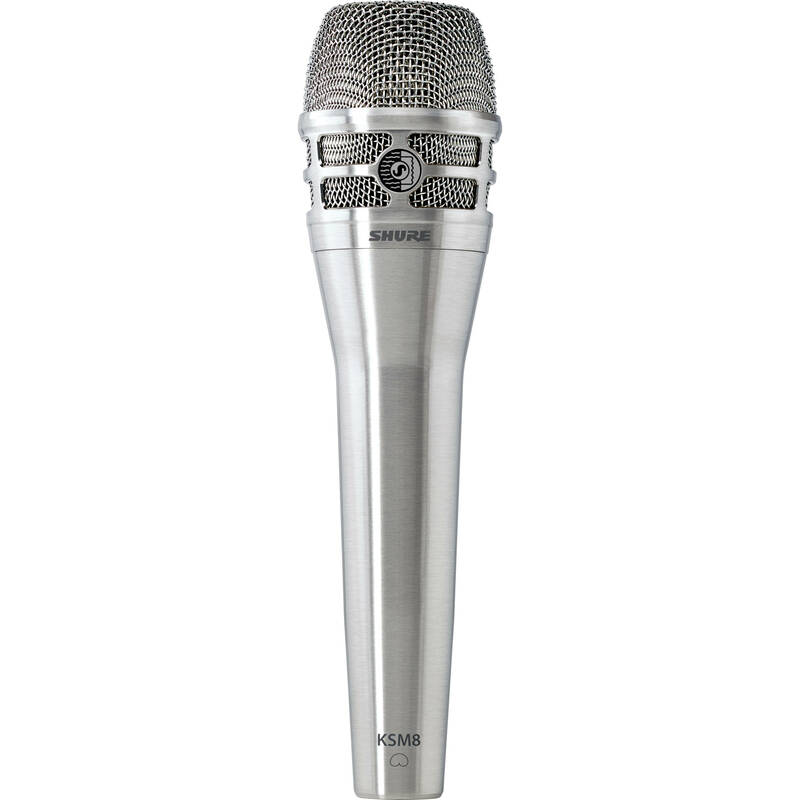 Rated 5 out of 5 by Daniel from The Shure KSM8/B Excellent Microphone. can it be shipped to india? It cannot. Jeff P's answer is correct.